Right out of the oven this is an impressive and beautiful dish. It comes from "Cooking at the Kasbah" by Kitty Morse. This Moroccan beef stew will instantly transport you to Morocco. I made this dish as part of a Moroccan/Persian dinner I had for friends. My friends husband, who said he doesn't like olives, but does like garlic, really enjoyed this dish. He didn't stop eating it even after we told him that the flavor he actually liked was coming from the olives. My own husband gave it his seal of approval and said I should feel free to make it anytime. Preheat the oven to 350 degrees F. In a medium Dutch oven or enameled casserole over medium-high heat, heat the olive oil and cook the beef, stirring until it is lightly browned, 3 - 4 minutes. Add the tomatoes, cumin, pepper and olives. Nestle the heads of garlic among the chunks of meat. Cover and bake until the meat is tender, 50 minutes to 1 hour. Remove from the oven. With a slotted spoon, transfer the meat and the garlic to a serving platter to keep warm. Reheat the pan juices over medium heat and stir in the lemon juice. Cook, stirring, until the sauce is reduced by one third. Pour it over the reserved meat. Sprinkle with parsley and serve immediately with warm bread. Note from the author: Spread the butterlike garlic pulp on a piece of fresh bread. Black olives are not generally used for this tagine. Cooks tips: I made this dish two days in advance and kept it in the refrigerator. I put the Dutch oven in an oven preheated to about 200 degrees for 25-30 min to reheat it. I tried to not stir it too much so I didn't break up the garlic bulbs. 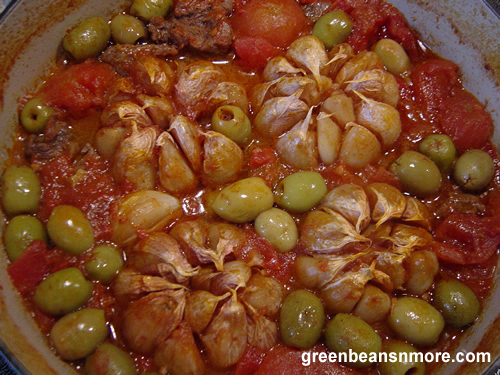 If you don't have Moroccan cracked green olives DO NOT MAKE THIS RECIPE until you get some. You can buy them here Zamourispices.com Due to the fact that it's been impossible for me to find consistently nice fresh tomatoes I've been using canned whole tomatoes in my recipes. I drain them before weighing them.